Fun. Just an absolute blast. You’re likely already familiar with this sort of game – civic planning and the like. You run a town, you decide how the money gets spent and where the buildings get built. But this time you do it as a pirate king. You provide your pirates with gambling dens, taverns, female companionship, and the like. You also build ships and send your captains out to bring back booty. That’s the game in a nutshell, but there’s real charm here as well. When you read the thoughts of your subjects (you’re a psychic pirate king) they’re often thinking amusingly snide things. Also, sometimes your captives will get uppity, and you’ll have to loosen the reigns on your pirates to put them back in their place. The graphics are excellent, and everything is designed to look extra piratey. But the real star of this game is the music, which is available on it’s own as a Soundtrack CD. Fun tropical music that makes excellent background music while remaining catchy enough to keep your attention. 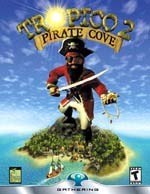 I found the CD is a great compliment to other pirate games that don’t have good background music of their own.